This is a series focused on personal journey with eczema while managing a certain aspect of life. Today, we have Jenny who is sharing about her eczema herpeticum experience. 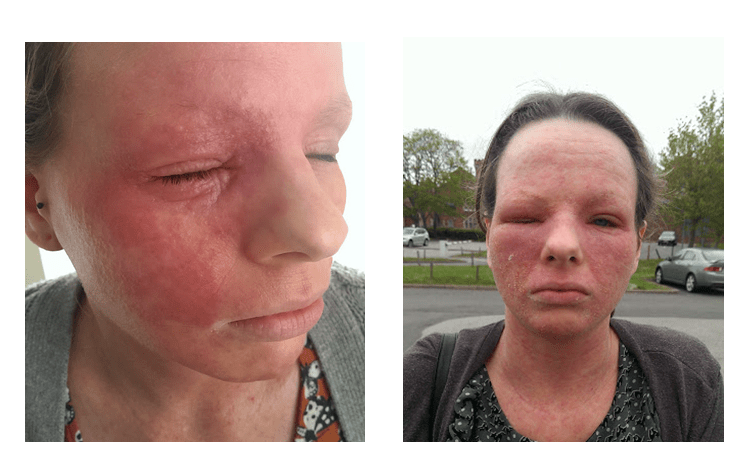 Jenny blogs about her own personal experiences with eczema at i-have-eczema. She also has a lovely blog at Little Jenny Wren on her crafts, cakes and fashion. Marcie Mom: Hi Jenny, thanks for sharing about your eczema herpeticum experience. Let’s start with you sharing a little of eczema history. Jenny: Hi Mei! Thanks for having me! Eczema only became a problem for me in my mid-teen years when I became a lot more exposed to environmental allergens. Since this time it has become very widespread affecting every part of my body except my nose, fingers and feet. As a child I suffered more so from asthma and hay fever but as an adult I suffer with severe eczema. 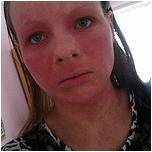 Jenny: Since April 2012 I’ve contracted Eczema Herpeticum 7 times. Eczema Herpeticum is when the herpes simplex virus presents itself in an eczema sufferer, but instead of getting a cold sore or two, the virus spreads rapidly through areas that are affected by eczema. This can be an extremely dangerous condition, especially if not treated swiftly, as it can go on to affect organs and even cause septicemia and other life-threatening conditions. My most recent outbreak is the worst I’ve ever experienced. It started in my eyes as a mild itch that I put down to being possible conjunctivitis. However over the course of the day the typical warning signs of eczema herpeticum became apparent as the cold sore-like vesicles presented themselves. It became so bad that I couldn’t even open my eyes. I also went on to develop a secondary infection of Periorbital Cellulitis so required emergency medical help. I then went on to spend 6 days in hospital being treated through an IV drip. It was pretty frightening as when I’ve suffered with eczema herpeticum in the past a dosage of Aciclovir tablets have been able to sort me out… but not this time. Marcie Mom: Is there any medication and follow-up consultation required? Jenny: In my case because I’ve contracted this virus so often, I am on a near-permanent course of Aciclovir tablets in order to keep it at bay. Most people would only require enough medication to treat the initial outbreak as it is uncommon for it to prevail as it has for me. I also see a dermatologist at the very least of once a month to ensure my skin is in good control. Marcie Mom: One final question – what would be your biggest take-away from this experience? Jenny: In all honesty I’m not sure how to answer this question. I’m now at a stage where I’m terrified that it will happen again to the extremity that I ended up hospitalised. It has only been a week since I was discharged after all. I guess in order to overcome it I need to get my immune system into a workable order as it is when you are run down and stressed that the herpes simplex virus breaks out. As an aside note, I have been taking immunosuppressants to control my severe eczema for a few years now and so these will not be helping to treat my immune system. If possible I would suggest to take eczema through the natural route to try to stop your immune system from getting into this state as mine has. I’ll also add that I was never affected with the herpes simplex virus until I met my current partner who periodically suffers from cold sores. I never in my wildest dreams expected it to manifest in me as it has. Cold sores are such a common contagious infection that can be spread through something simple such as sharing towels and touching things that the infected person has touched. They’re pretty hard to escape from so always practise good hand hygiene where possible. Marcie Mom: Thank you so much for sharing your eczema herpeticum journey, quite a few children had it too and parents reading this would have gained some insight. I’ve looked over your blog and the photos of your condition and it is almost like looking in a mirror. I contarcted eczema hermetic umbrella 5 years ago and it has at times been a living hell. This condition is also exarcabated by the fact that I also have many allergies. Is there a possibility that I could get in touch with you some how to talk over ways in which you manage certain things with your condition and things you may have found useful? I’d be most grateful. Lysine supplements prevent the replication of the herpes virus, take is consistent to prevent a break out or take a few 100mg (300-600mg)of it when a breakout is near. Thanks for the share, have a good day! Man I feel for you – your eczema in those pictures look really painful and itchy. I have never suffered with eczema but felt as I was going through it too when my son suffered severely from the age of 3 months. If like me you have people all the time offering advice about try this or that, you may instantly feel you want to dismiss my suggestion but it is a different suggestion and I’m not trying to sell you anything so just hear me out. There is something called colloidal silver. It is basically minute silver particles in purified water. Thats it. Through out history silver has been used as a natural antibiotic, it kills thousands of types of bacteria whilst healing the skin! They put silver into plasters in burns units to help heal the skin. Please look it up. I found one thing that really helped when my son’s eczema was weeping (infected) spraying colloidal silver would help no end. Please look it up as I think it can help you if you have another outbreak. You can read my story on my site if you so wish. Ps. Stay away from antibiotics. That is why my son got eczema in the first place after having too many too young. It destroys the flora in the gut. Love and good wishes to you. Please stay in touch and let me know how you get on. Thank you for sharing your story. I agree whole-heartedly that we need to look at as many natural ways to fight eczema. I just learned about the meds that break down your immune system to stop the symptom. It sounds backwards doesn’t it? Have you ever tried essential oils or learned much about them? Thanks Tamara for dropping by my blog 🙂 You can find Jenny on her site (link) in the intro, cheers!